Established in 1938, China Tuhsu Yunnan Tea Import & Export Corporation greatly promoted the development of Pu-erh tea. This excellent raw Pu-erh cake was produced by Yunnan Tea Factory in 2004, prepared with great care by using ecological tea leaves from arbor wild tea trees. 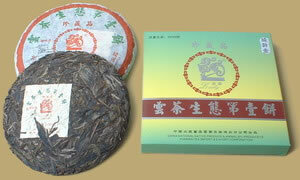 The tea has a strong lasting flavor and assertive fragrance, it combines essence of Pu-erh in one. Perfect for long-term storage.